Amazon is well known as one of the best companies to work with as an affiliate: if for nothing else their size, large number of products and brand recognition. Most people getting into affiliate marketing will be told to set up and Amazon Associates account, and start adding links to their site. Amazon also offers various widgets and banners and such like, but they actually aren’t that great. Back in 2016 Amazon launched the Amazon Native Ads system to seemingly little fanfare. In fact it wasn’t until recently that I even realized that the native ads system was up and running! 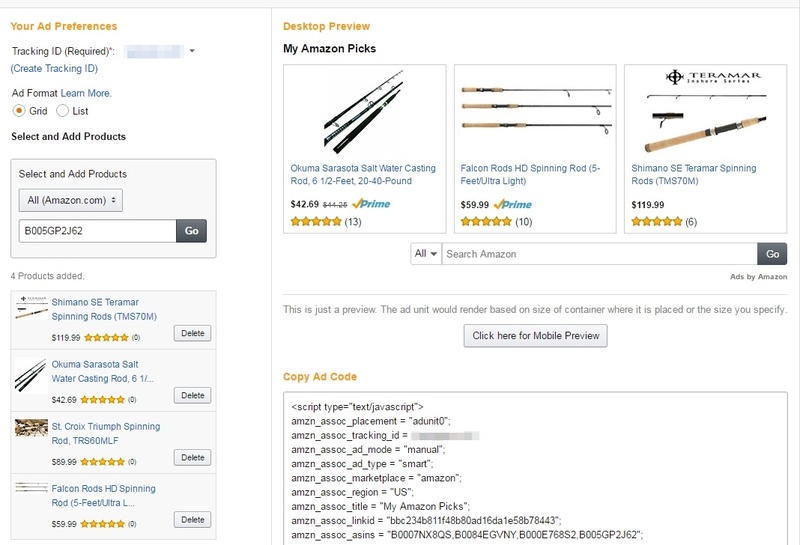 Why Use Amazon Native Ads? Like Google’s Adsense adverts, Amazon’s Native Ads now take into consideration the content of the page in order to determine what products to show. If your article is about cameras, then you will get camera related products showing. This isn’t as exact as Google’s as it relies on both the term you choose when creating the ad and also other Amazon links in your content. Still it’s more intelligent than a standard advert. Advert retargeting is a proven method for increasing conversions. The basic idea is that if someone visits a site they get a cookie and then on other sites they are shown adverts about the previous site they visited. Amazon uses a similar principle that they call interest based ads. If a visitor has already viewed products on Amazon then the native ads will take it into account when choosing what products to display to the visitor. In this mobile first world, having responsive adverts is a no brainer, but it’s still amazing how many sites have non responsive adverts! Amazon makes sure that yours will work regardless of device and without any work on your part. This advert type provides the most control over what’s seen, but does take a bit more work to use. In essence you select the products that will be seen on the advert. This is great for posts that cover a few products as you can then select those products and insert them into the advert. These adverts are based off of a keyword you provide to begin with and provide relevant products. 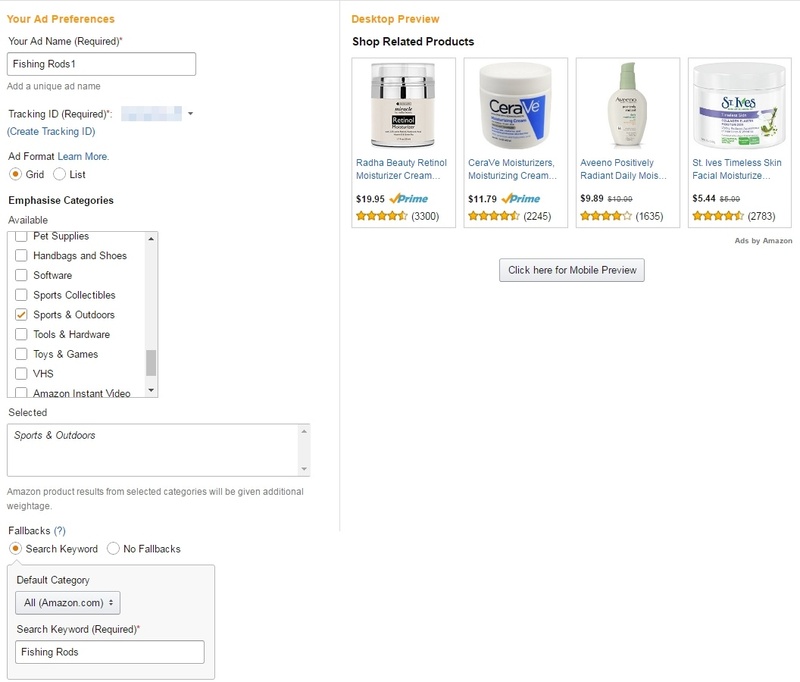 The key feature is the inclusion of a search bar that users can use to search directly on Amazon for the products they want. It’s not as focused as custom or recommendation ads, but is great for sites that see lots of internal searching happening. This ad type is like a cross between the custom and search without the work. Add a category and a search fall-back and paste the code onto your site and leave it be. The advert uses the post content and other Amazon links in the articles to determine what to display. As well as that it uses the interest based ads technology to further improve results on a per visitor basis. You can disable this on a per advert basis, but why would you? The better the products relate to the customer the more likely they will buy. It also combines the search system allowing customers to search Amazon from your site. Finally it has a category fall-back in case the content doesn’t have enough information to provide the algorithm with enough data to work with. 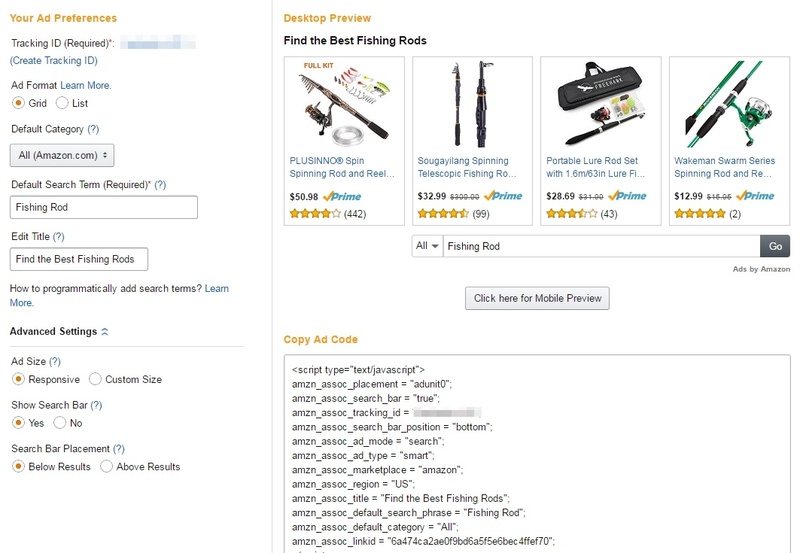 Like any other Amazon advert or banner, after you select the type you want and fill out the settings, you will be given some code to add to your site. As a WordPress user you could add this directly into posts or widgets, or make use of one of the many advert plugins there are available. Right now, it still looks like Amazon Native Ads are only available for the US version of Amazon Associates, which is a shame. Amazon certainly isn’t the fastest company for rolling out new affiliate features so perhaps native ads will come to the other countries in due course. Amazon Native Ads aren’t going anywhere it seems; especially after a recent push for affiliates to use them (they gave affiliates 12% commission in Nov 2016 for native ads only). These adverts definitely make promoting Amazon products that much easier as it allows you to take away some of the guesswork by allowing Amazon to choose the products for you based on the content and visitor history! While I can’t provide evidence of increased conversions, the general scuttlebutt about them has been positive. Why not test them out and see for yourself! Don’t waste your time. Amazon cares only for buyers. Amazon is a pure scam to sellers and publishers. If you ever make something meaningful, they will find a way to do this “Under the terms of the Operating Agreement, we may terminate your account at any time, with or without cause.” and pay you nothing. They did that to me on the day before they are supposed to pay me – for an account they have audited twice. Why the day before? Any reason given? None. You’d be better off with adsense or something else. Also, don’t ever try their CPM … complete junk.